Hamsters are naturally clean animals that groom themselves on a regular basis. 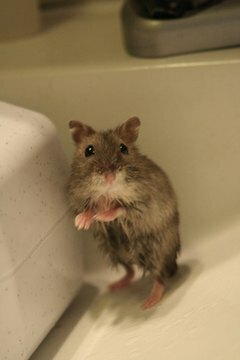 Most hamsters maintain a healthy level of cleanliness without any type of assistance from their owners. It's universally recommended that, in the event your hamster is unable to get himself sufficiently clean, you should not bathe him in water because hamsters can quickly catch a cold and may die as a result. Sand baths provide alternative method of cleaning your hamster without risking his health. Sand bath is a commercial product made specially for hamsters and other small mammals. Sand baths may be labeled as chinchilla sand bath, hamster sand bath or just general purpose sand bath. These products are available in pet stores or in the pet section of major retail stores. A number of animals use abrasive sand to clean themselves in the wild, and sand baths are designed to replicate the effect in a cleaner, more sterile captive setting. You give your hamster a sand bath by pouring an inch or two of sand bath product into a sturdy bowl or container that is large enough for your hamster to roll in comfortably. Hamsters are generally not picky about the shape of the bowl so long as it is easy for them to climb in and out of with adequate room for movement. A bowl such as a wok, with a rounded bottom, ensures the sand doesn't pack into corners. Make sure the bowl is heavy enough that your hamster will not flip it over while rolling or climbing in and out. Do not use bowls that are made of materials your hamster will be easily able to chew up, such as plastic and wood. Place the container in the hamster's living enclosure. Ideally, your hamster will discover the sand bath and begin rolling in it. In the wild, animals often clean themselves with sand and dirt . Sand is naturally abrasive and a good alternative to water for animals that would be made vulnerable by taking a bath in liquid. The abrasion created when your hamster rolls in the sand bath functions to remove the excess particles from the coat. The sand itself absorbs excess oils and moisture from the skin and coat. You can provide your hamster the material for a sand bath, but you cannot make him use it. Most hamsters like sand baths, but some individuals may not know what to do or may not enjoy the sand bath. Give your hamster some time to figure out what do to with the sand bath if he does not immediately begin using it. Just make sure to check the sand bath regularly if you leave it in your hamster's cage; some hamsters may mistake the sand bath for a sand toilet. Dust Bath or Sand Bath? Dust baths are very similar to sand baths, and the two are often mistaken or interchanged. It is important to pay attention to what you're buying: Dust bath products have finer grain particles that can cause respiratory problems for your hamster. Use only sand bath. Do not use any product that is labeled as a dust bath on your hamster. Do not use any product that is not labeled specifically for use on pets.